The book is concerned with one of the most interesting and important topological invariants of 3-dimensional manifolds based on an original idea of Kurt Reidemeister (1935). This invariant, called the maximal abelian torsion, was introduced by the author in 1976. The purpose of the book is to give a systematic exposition of the theory of maximal abelian torsions of 3-manifolds. Apart from publication in scientific journals, many results are recent and appear here for the first time. Topological properties of the torsion are the main focus. 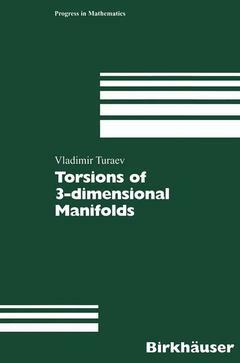 This includes a detailed description of relations between the torsion and the Alexander-Fox invariants of the fundamental group. The torsion is shown to be related to the cohomology ring of the manifold and to the linking form. The reader will also find a definition of the torsion norm on the 2-homology of a 3-manifold, and a comparison with the classical Thurston norm. A surgery formula for the torsion is provided which allows to compute it explicitly from a surgery presentation of the manifold. As a special case, this gives a surgery formula for the Alexander polynomial of 3-manifolds. Treated in detail are a number of relevant notions including homology orientations, Euler structures, and Spinc structures on 3-manifolds. Relations between the torsion and the Seiberg-Witten invariants in dimension 3 are briefly discussed. Students and researchers with basic background in algebraic topology and low-dimensional topology will benefit from this monograph. Previous knowledge of the theory of torsions is not required. Numerous exercises and historical remarks as well as a collection of open problems complete the exposition. I Generalities on Torsions.- I.1 Torsions of chain complexes and CW-spaces.- I.2 Combinatorial Euler structures and their torsions.- I.3 The maximal abelian torsion.- I.4 Smooth Euler structures and their torsions.- II The Torsion versus the Alexander-Fox Invariants.- II.1 The first elementary ideal.- II.2 The case b1 ? 2.- II.3 The case b1 = 1.- II.4 Extension to 3-manifolds with boundary.- II.5 The Alexander polynomials.- III The Torsion versus the Cohomology Rings.- III.1 Determinant and Pfaffian for alternate trilinear forms.- III.2 The integral cohomology ring.- III.3 Square volume forms and refined determinants.- III.4 The cohomology ring mod r.- IV The Torsion Norm.- IV.1 The torsion polytope and the torsion norm.- IV.2 Comparison with the Thurston norm.- IV.3 Proof of Theorem 2.2.- V Homology Orientations in Dimension Three.- V.1 Relative torsions of chain complexes.- V.2 Induced homology orientations.- V.3 Homology orientations and link exteriors.- V.4 Homology orientations and surgery.- VI Euler Structures on 3-manifolds.- VI.1 Gluing of smooth Euler structures and the class c.- VI.2 Euler structures on solid tori and link exteriors.- VI.3 Gluing of combinatorial Euler structures and torsions.- VII A Gluing Formula with Applications.- VII.1 A gluing formula.- VII.2 The Alexander-Conway function and surgery.- VII.3 Proof of Formula (I.4.e).- VII.4 The torsion versus the Casson-Walker-Lescop invariant.- VII.5 Examples and computations.- VIII Surgery Formulas for Torsions.- VIII.1 Two lemmas.- VIII.2 A surgery formula for ?-torsions.- VIII.3 A surgery formula for the Alexander polynomial.- VIII.4 A surgery formula for ? (M) in the case b1(M) ? 1.- VIII.5 Realization of the torsion.- IX The Torsion Function.- IX.1 The torsion function, basic Euler structures, and gluing.- IX.2 Moments of the torsion function.- IX.3 Axioms for the torsion function.- IX.4 A surgery formula for the torsion function.- IX.5 Formal expansions in Q(H) with applications.- X Torsion of Rational Homology Spheres.- X.1 The torsion and the first elementary ideal.- X.2 The torsion versus the linking form.- X.3 The torsion versus the cohomology ring mod r.- X.4 A gluing formula.- X.5 A surgery formula.- X.6 The torsion function and its moments.- XI Spinc Structures.- XI.1 Spinc structures on 3-manifolds.- XI.2 The torsion function versus the Seiberg-Witten invariants.- XI.3 Spin structures on 3-manifolds.- XII Miscellaneous.- XII.1 Torsions of connected sums.- XII.2 The torsion versus the Massey products.- XII.3 Genus estimates for ?r-surfaces.- Open Problems.